Are you looking for a pumpkin pudding recipe that you can make in your crock-pot? 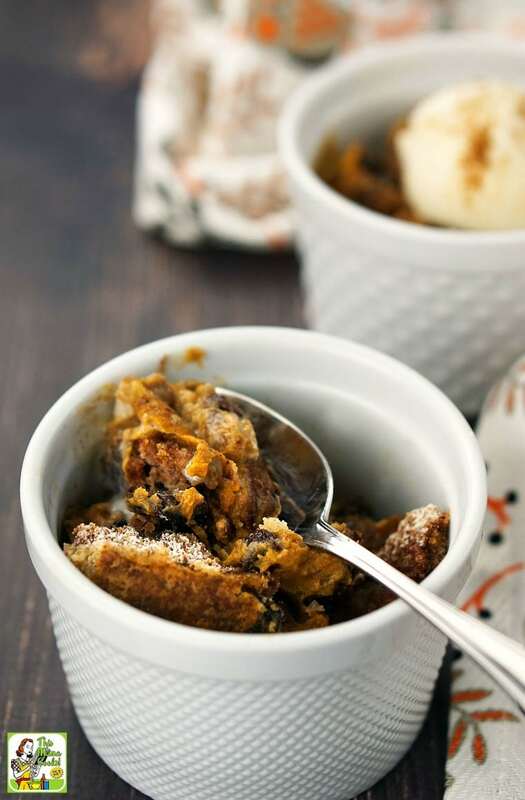 Then you’ll love this Gluten Free Slow Cooker Pumpkin Pudding recipe! Just add a few ingredients together. Then cook for less than three hours in your Crock-Pot and you’ll have a pumpkin pudding dessert that the whole family will rave over. 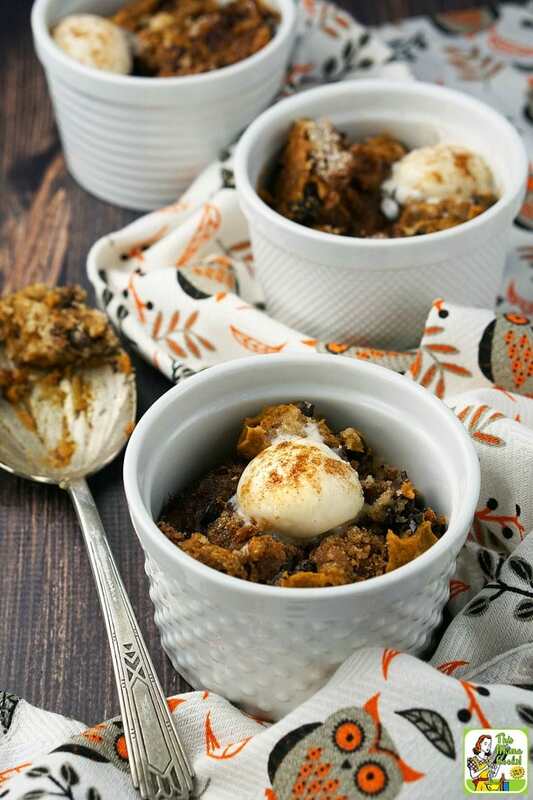 This slow cooker pumpkin pudding recipe isn’t quite like a pumpkin bread pudding though. It’s more like a layer of creamy pumpkin mousse topped by a layer of (gluten free) cake. It’s uniquely flavored with chewy dried cherries and little bits of chocolate. Doesn’t that sound good? Serve this pumpkin pudding recipe with a scoop of ice cream and it’ll become one of your favorite gluten free pumpkin desserts to serve in the fall during Halloween and Thanksgiving. A slow cooker pumpkin pudding that’s gluten free! Gluten Free Slow Cooker Pumpkin Pudding is gluten free and dairy free. Best of all, all the ingredients for Gluten Free Slow Cooker Pumpkin Pudding can be found at your local grocery store. No trip to the health food store needed! I wanted to make this slow cooker pumpkin pie pudding recipe as easy as possible, so I used canned pumpkin puree. If you want to make pumpkin puree from scratch, check out How to Cook Fresh Pumpkin. I used canned coconut milk since it’s a bit thicker than the kind you buy to drink. You can find it in the Asian food or health food aisles at your grocery store. 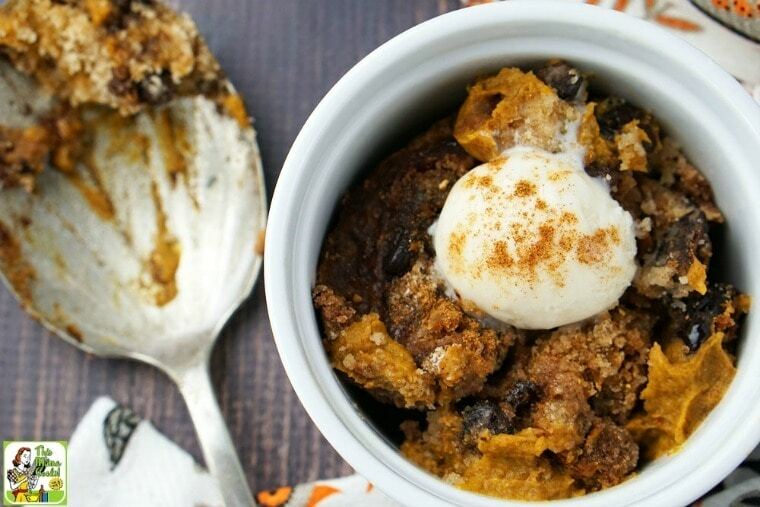 You can use your favorite gluten free cake mix for this slow cooker pumpkin pudding recipe. I used Betty Crocker Gluten Free Yellow Cake Mix, which is in the baking aisle. Since I wanted this slow cooker pumpkin pudding recipe to be both gluten free and dairy free, I used Guillard semi-sweet baking chocolate chips. You could also use Enjoy Life Semi-Sweet Chocolate Mini Chips which are gluten free, dairy free, soy free, and nut free. Both brands taste and cook up great! Since I wanted to keep this pumpkin pudding recipe dairy free and vegan, I used Earth Balance in my Gluten Free Slow Cooker Pumpkin Pudding recipe. You can find this in the refrigerated case of the health food section at Kroger. Finally, I used vanilla So Delicious “ice cream” as a topper. My favorites are the soy milk and coconut milk varieties. Coat inside of a 4-quart Crock-Pot with cooking spray. Add the pumpkin puree, coconut milk, monk fruit or stevia, and 1 tablespoon of pumpkin pie spice to the Crock-Pot. Stir ingredients together. Then spread pumpkin batter evenly at the bottom of the crock. Add cake mix, dried cherries, chocolate chips, and remaining tablespoon of pumpkin pie spice together in a medium bowl. Stir thoroughly to distribute cherries and chips throughout cake mix. Evenly pour the cake mix over the pumpkin batter in the Crock-Pot. Drizzle melted buttery spread over the cake mixture. Cover and cook on high heat for 2 1/2 hours. Remove the crock insert (if possible). Or turn off Crock-Pot. Uncover and cool for 30 minutes. 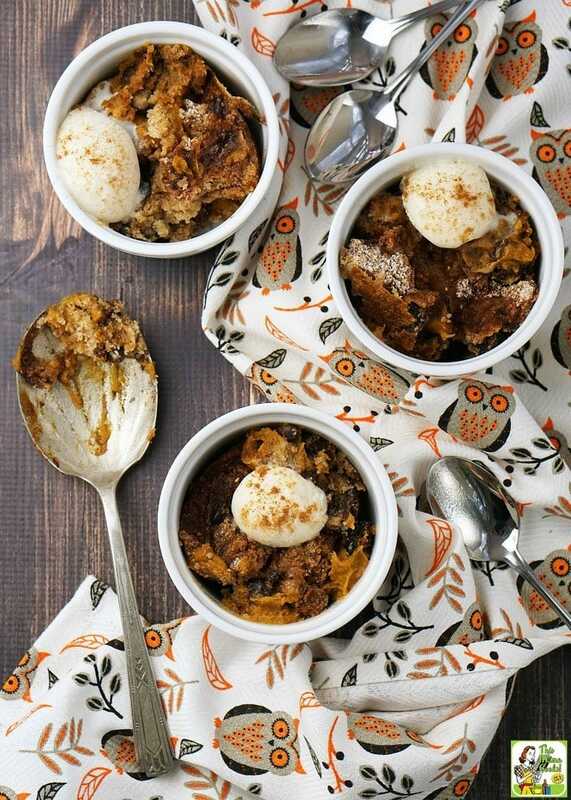 To serve, spoon warm pumpkin pudding into bowls. Top each serving with a scoop of vanilla ice cream, if desired. Garnish ice cream with a slight pinch of pumpkin pie spice. Originally published on October 17, 2016. Updated with new pictures and information. 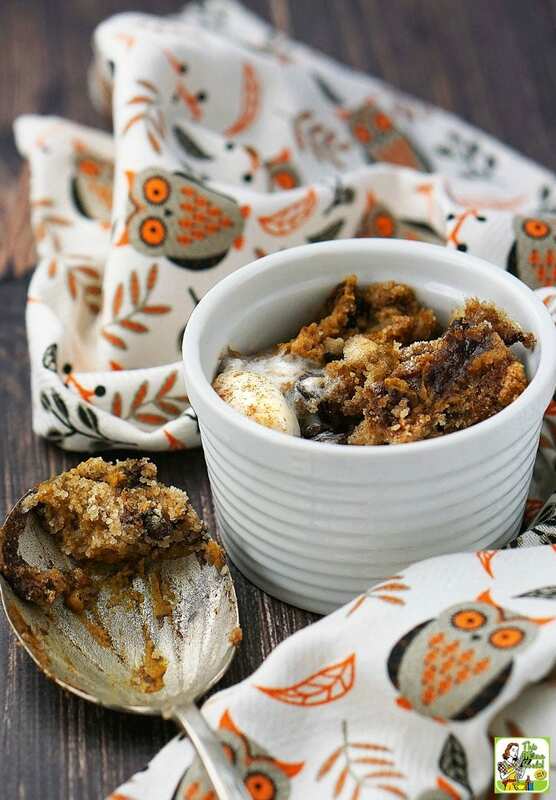 Posted in Crock Pot and Slow Cooker, Desserts, Gluten Free, Recipes, Thanksgiving and tagged bread pudding, Halloween, pumpkin on September 20, 2018 by Anne-Marie Nichols.